- This is the largest group: including 6 species. The group contains a third of all penguin species, and all those penguins do have a yellow or golden crest. - The name "Eudyptes" derives from the Greek and means "good diver". In French this group is called gorfou, what derives from the Scandinavian "goirfulg": a name which was given to the extinct giant auk. 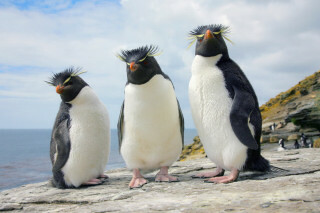 - The crested penguins live on most of the islands at a latitude of 37° and 57° South. They mostly breed in large colonies of thousands of birds, where it is very noisy and often aggressive behaviour is seen. - Each pair here lay also two eggs, but, in contrast with other groups, with an interval of around 6 days and the first laid egg is much smaller and will almost never hatch. They suppose crested penguins stop too late making their nest and throw the first egg out, together with sand and ground. As soon as the egg is outside, they lose interest. Not until the second egg is laid, they start to breed properly. - They only make, while short on material, a very rudimentary nest under cliffs, between rocks or under vegetation. - Some species breed under trees in the rainforest and they can even be seen, sitting in those trees. - Crested penguins moult after the breeding season and then leave their nesting places, so you can consider them as migratory birds. 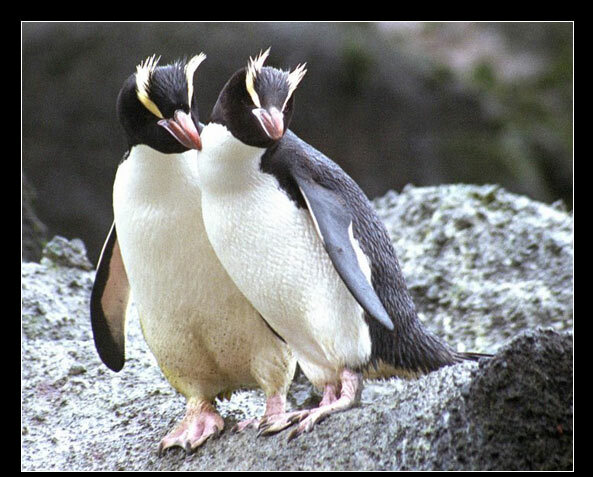 - The species of the warm sea regio (moderate and tropical oceans) are erect-crested, Snares crested and Fiordland penguins. 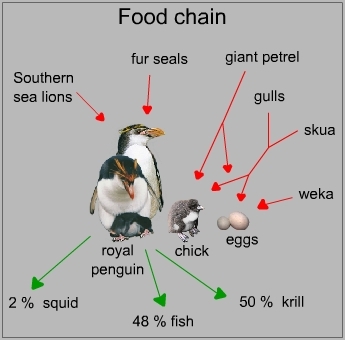 The 3 other species (royal, macaroni penguins and rockhoppers) belong to the cold-sea penguins (polar and en subpolar oceans), but they live more to the edge of Antarctica and don't have to face its extreme cold temperature, so their fatty layer and the feathers are a bit thinner than for the emperors. it is the only species which can stick up their crest straight up in the air. On sea they are hardly distinguished from the Snares crested and fiordland penguins. 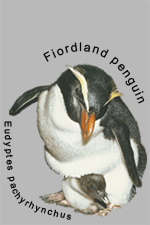 But there is a small difference while the crest of erect-crested penguins starts at the gape of the bill, in contrast to both Fiordland and Snares penguins where the crest starts a bit higher at the base of the top plate of the bill. And the strip of bare skin on the bottom edge of the bill is another feature to identify the species. (see also characteristics). Chicks have a grey-brown back and a white belly. One of the largest crested species, they measure about 57 cm tall. Their weight varies during the year with around 1 kg. Typical weight, before moulting, is around 6 kg. 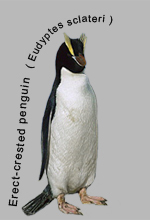 The erect-crested penguin is firstly described by Buller in 1888. Erect-crested penguins breed in large colonies on sub-Antarctic Islands south of New Zealand, especially the Antipodes and Bounty Islands. The breeding population is estimated at 164 000 pairs. They make a very rudimentary nest with some stones and mud. There is a lot of competition for the best nesting places in the rock cliffs and/or caves which causes many fights between them. Begin September the male comes back to the old nest, followed two weeks later by the female. In October the female lays two eggs, but only the second laid, larger one is hatched during 35 days. Some colonies are shared with rockhoppers and albatrosses. As soon as the chicks are too big to stay between the feet of the adult, they gather in a crèche. The chicks fledge end January-begin February when they are about 70 days old. The adults then go to sea to feed for about a month, before they return to moult. Afterwards (March-April) they migrate to sea again for overwintering and just come back to the colony not until the beginning of a new breeding season in September. 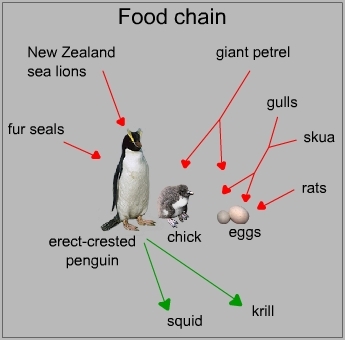 Little is known about their diet, but they suppose erect-crested penguins mainly feed on squid and krill. They may travel till 100 km in search for food and mostly forage close under the sea surface. While they breed on islands, there aren't many introduced predators near their nesting places, so eggs and chicks are only threatened by giant petrels, skua's and gulls. The adult penguins are chased on sea by fur seals and sea lions. 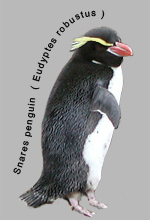 Snares penguins have a "sulphur-yellow" crest which starts at the base of the top plate of the bill, over the eye till the back of the head where she droops down. They have a very robust bill. Both sexes are alike, but the male is a bit heavier and his bill more robust. 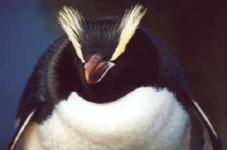 Their eyes are dark red, but not as bright as in the rockhopper. Young birds have a pale chin and short crest. Snares penguins are about 47 cm tall. They weight 3 till 4 kg, with fluctuations of more than 1 kg during the year. In 1953 the Snares penguin was firstly mentioned. 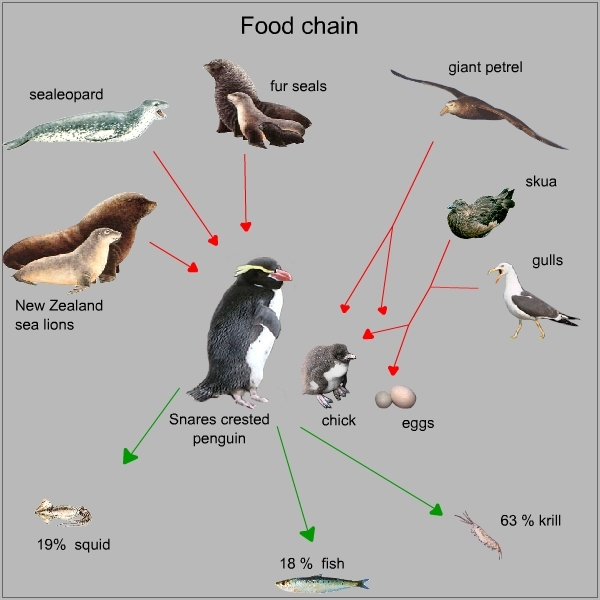 Snares penguins are sometimes called Snares crested penguins or Snares Island penguins. Snares penguins only breed on the small (341 ha) Snares Islands, southern of New Zealand. The breeding population is estimated at 23 250 pairs (counted in October 2000 by Dave Houston). 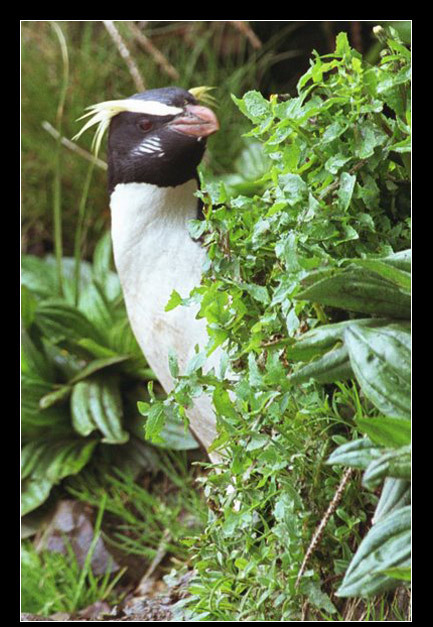 The males return to their old breeding place in August and construct a shallow nest from earth and stones, under the vegetation. Sometimes you even can see them resting on a tree. They breed in densely colonies with till 1500 pairs. 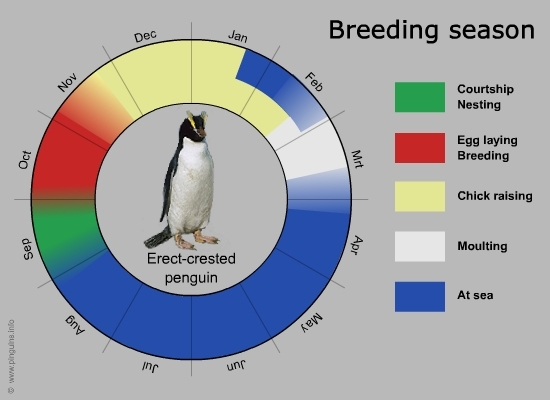 Two eggs are laid in mid September-early October, but only one chick hatch (as for all crested penguins). Incubation takes 31 till 37 days, in long shifts (10-12days) by both parents. Once hatched, the male guards the chick during the first weeks, while the female forages and daily feeds the chick. After 3 weeks the chicks form small crèches, daily fed on their nest by both parents. The chicks moult and leave the nest in January at the age of 75 days (11 weeks). The adults now too leave the colony to forage for 2 months on sea and then return to moult in April. Between May and August, the colony is abandoned. 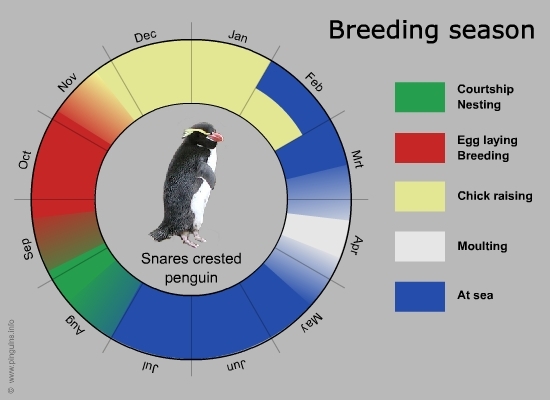 They believe Snares penguins become sexually mature after 6 years. 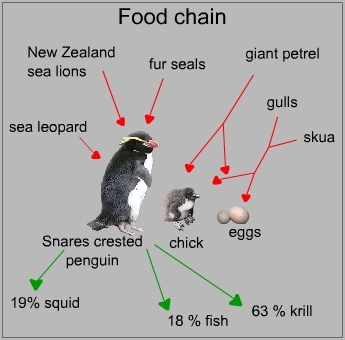 The diet of Snares penguins is not well known. It is believed the diet consists of 63% krill, 19% squid and 18% fish. Where and how they forage is unknown yet. Adults at sea are threatened by sea lions and leopard seals, and the eggs and chick are stolen by skua's and gulls. Althought not threatened, the species is believed to be vulnerable because they breed very locally on the small Snares Islands group. The islands are luckily free of introduced land mammals, and that has to stay so for the sake of the birds, and therefore the islands are closed to the public. 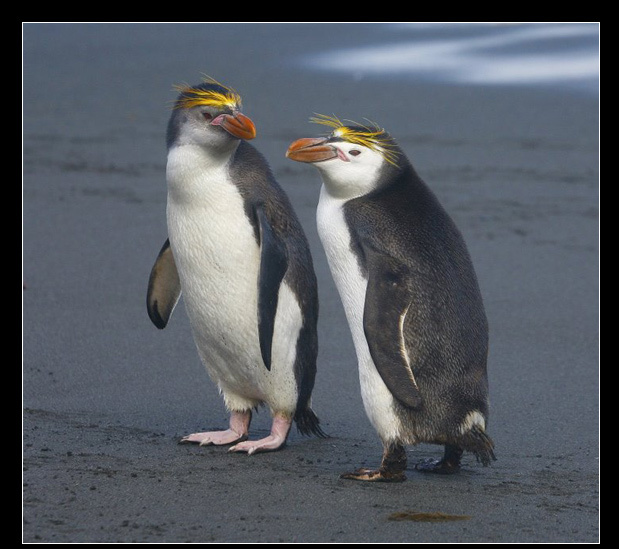 Fiordland penguins are much alike erect-crested penguins. You can distinguish them by the small white stripes on their cheek. The sulphur-yellow crest starts at the base of the upper plate of the bill and goes over the eye to the back of the head. Contrary to the erect-crested, they can not stick up their crest. Juveniles have a brown grey back and white front. They have a shorter crest and pale cheeks. It is the most timid of the crested species. 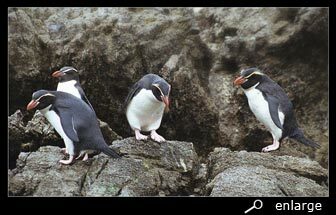 Fiordland penguins are about 47 cm tall. They weight 3 till 4,5 kg, with fluctuations during the year. 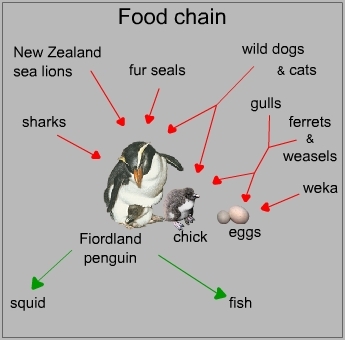 The fiordland penguin was firstly described by Gray in 1844. Alternative names are fiordland crested penguins, New Zealand crested penguins, thick-billed penguins or "Groucho Marx" penguins. 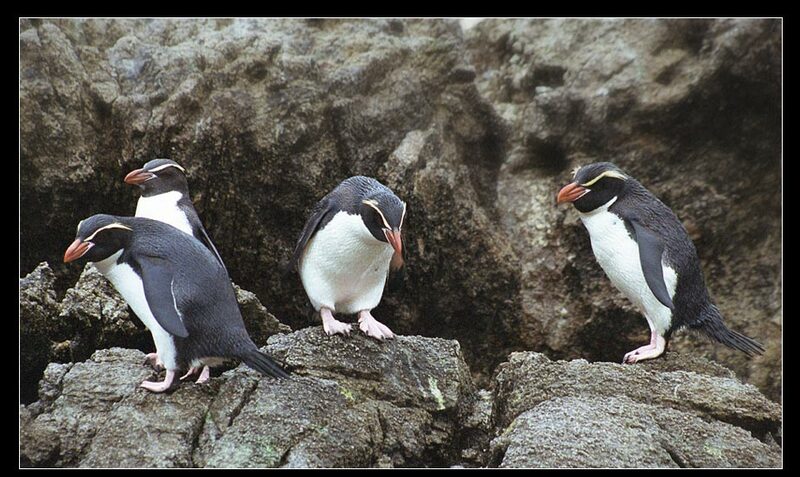 Fiordland penguins breed on the southwest coast of the South Island of New Zealand and on Stewart Island. Population is estimated to be 3000 pairs. 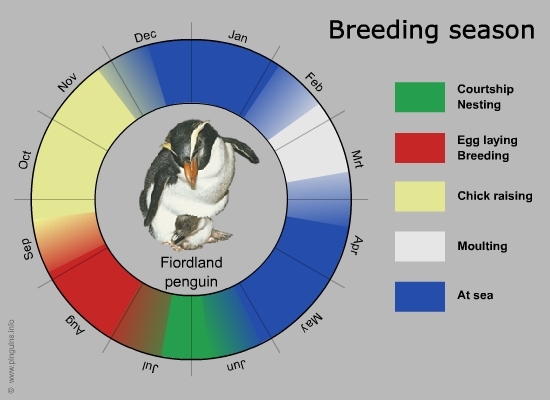 Fiordland penguins breed individually, not close to other pairs. in het New Zealand rain forest. They build nests in caves, under bushes or trees or in brushwood, close to the coast. While they are very nest-bound, they return each year in June to their old nest and partner. The female follows the male shortly after. 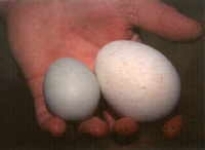 Two eggs are laid in July-August, but only the second, largest, last laid egg mostly hatch. Incubation takes 30 till 36 days, in alternate shifts of 5 till 12 days. The first weeks after hatch, the male guards the chick and the female forages and feeds it daily. After those first weeks, the chick will be left alone or in small creches, while both parents forage and delivers food. The chick will always be fed at the nest. Chicks moult to their juvenile feathers and fledge in November at the age of about 75 days (10 weeks). They will return after 5 years to start breeding for the first time. Adults go to sea for 2 months to eat, before returning to moult in February-March. The colony is abandoned from end March till June, when a new breeding season starts. Little is known about the diet, but it is believed they mainly feed on squid, with a complement of crusteceans and a bit of small fish. While they return daily to their chicks during breeding season, they suppose the penguins forage within a range of 10 km around their nesting place. 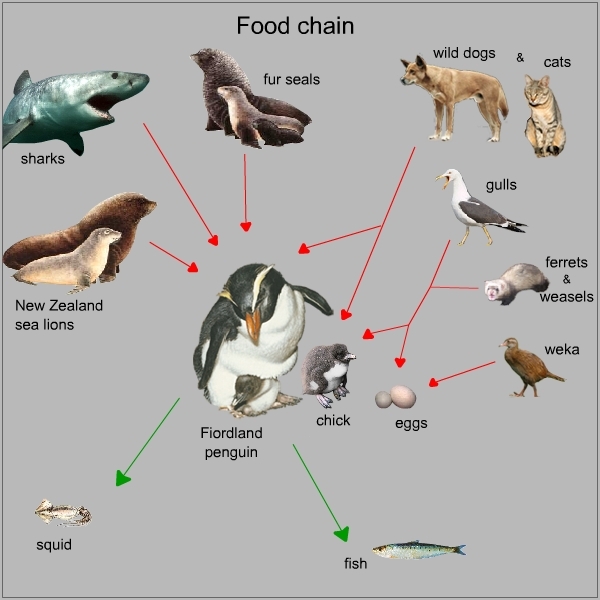 Fiordland penguins breed on the mainland of South Island (New Zealand), where a lot of different introduced mammals live too. Chcicks and eggs will be threatened by mustelids like ferrets and weasels, wild dogs and roaming cats, rats and even weka's steal eggs. From the air chicks are sometimes chased by gulls, but this is rather seldom while a roof of dense foliage makes them nearly invisible from above. Adults and juveniles in the sea become victims of sharks, fur seals and sea lions. Rockhoppers are the smallest species among the crested penguins. They can be identified by the outline of their crest: they only have a small yellow line that starts at the bill and runs to the back of the head, where it extends in a long and wide crest. They have bright red eyes, in contrast with the other crested penguins, which all have darker eyes. 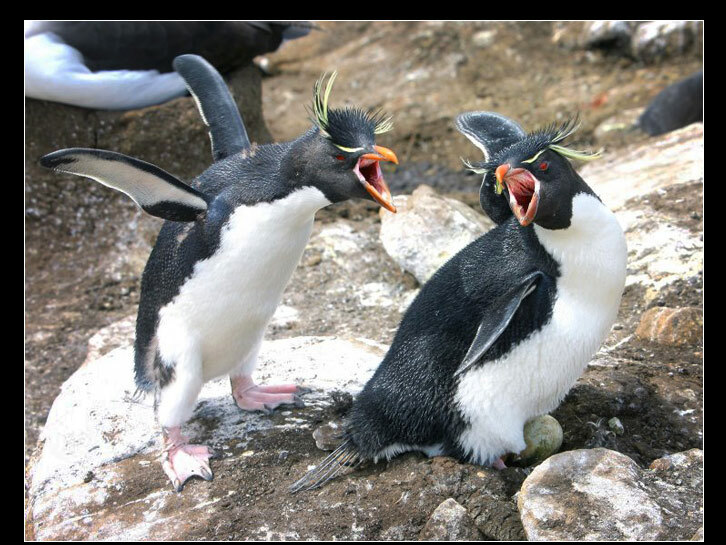 Rockhoppers are fairly aggressive. Chicks have a grey black back and a white front. Eudyptes chrysocome filholi are a bit larger and have a very thin yellow line on their head. Eudyptes chrysocome chrysocome (southern) are the majority and smallest ones and have a broader line with a longer, more extending crest. Eudyptes chrysocome moseleyi (northern) have the longest crest, which can reach to the boundary of the throat. Adult rockhoppers vary in size between 45 till 50 cm. Rockhoppers have a very various weight, depending on the size. Larger penguins weight up to 5 kg, but the moderate weight fluctuates around 2,7 kg. Linnaeus mentioned in 1758 two species in his Systema Naturae: namely the african penguin and the rockhopper (named 'Eudyptes crestatus'). In Latin you sometimes even can find the name Aptenodytes chrysochome. 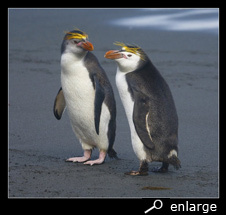 In Dutch the rockhopper is also called geelkuifpinguïn, meaning yellow crested penguin. Rockhoppers breed on almost every sub-Antarctic island. - E. c. filholi (red stips): Crozet, Marion, Heard, Prince Edward and Kerguelen Islands, Macquarie Island, Campbell, Auckland and Antipodes. - E. c. moseleyi (Northern) (pink stips) breed in smaller colonies on Tristan da Cunha, Gough and Amsterdam and St. Paul Islands. The total breeding population is estimated at 3 700 000 pairs (of whom E. c. chrysocome contain 2,5 million pairs). They breed in large, highly dense colonies on cliffs and slopes on several islands. The nests consist of shallow excavation sites, made with stones and vegetation. Caves and overhanging cliffs are preferred, while they offer protection against the weather. Rockhoppers conquer a lot for the best places and aggressive behaviour is normal practice with them. Some colonies are shared with the larger erect-crested penguins. 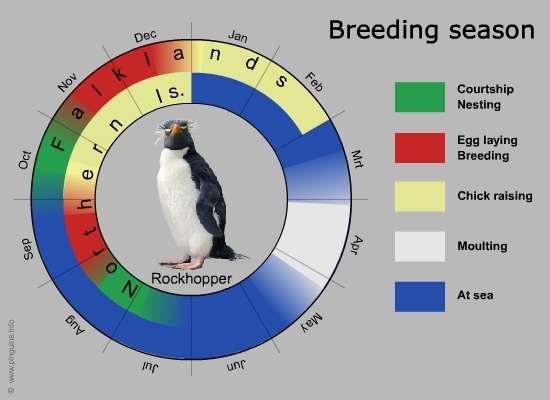 There is a large time interval between the breeding season of the Northern subspecies (E.e.moseleyi) and the more southern breeding subspecies (E. c. chrysocome on Falklands etc.). 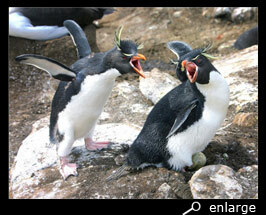 The males arrive on the Falklands in October, two weeks later followed by the females. For the northern subspecies they arrive already in July. Two eggs are laid (southern in November; northern in September), but, as usual among crested species, only the larger, secondly laid egg will hatch and the chick be raised. During incubation (32 till 34 days), the parents alternate with equally long shifts of 10 days. The males guard and take care for the hatched chick during the first period of 24-26 days, while the female forages and feeds the chick daily. Then the chicks form small crèches and the parents both feed the chick. The chicks moult to their juvenile plumage and fledge in February (December-January at the northern subspecies) when they are 65 till 75 days old. The adults moult in April, after a perion at sea to eat. For the northern subspecies, this period at sea before moulting lasts a lot longer (till up to 2 months) than for the southern one. Rockhoppers have a mixed diet of 60 à 70 % krill, with a complement of fish and squid. They forage close to the sea surface. The adults and juveniles are chased by leopard seals, sea lions, fur seals and sharks. 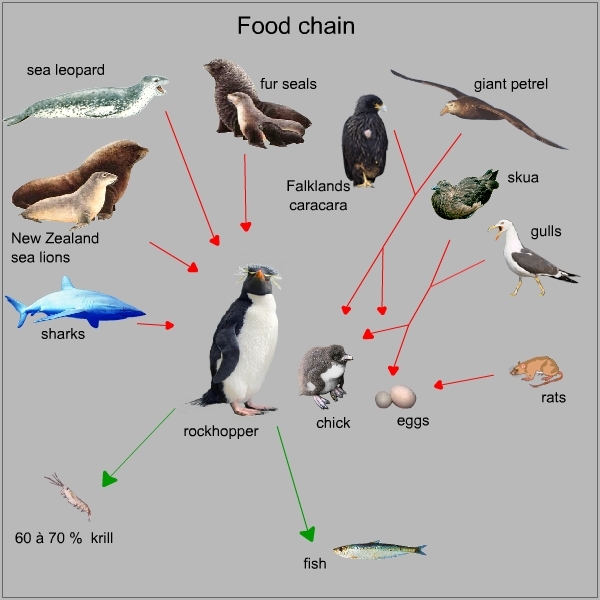 Eggs and chicks are stolen by giant petrels, gulls and, on the Falklands, caracara's and rats too. 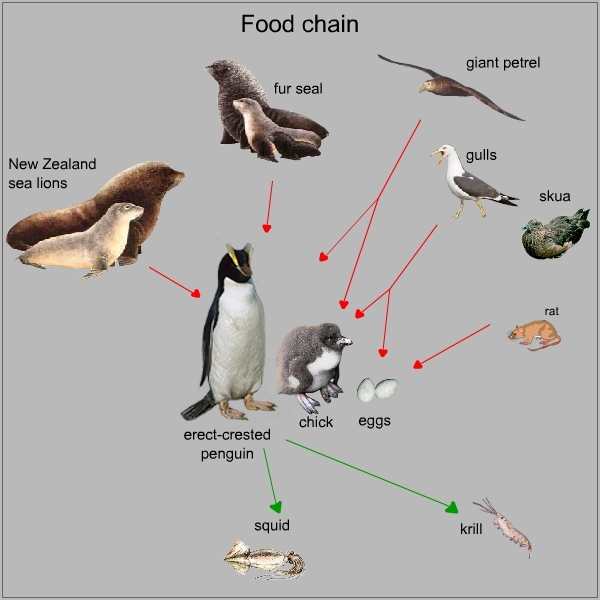 Many breeding places are free of introduced mammals, so it is unknown why the population is declining around New Zealand. 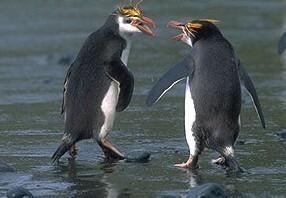 Macaroni penguins can only be mixed up with royal penguins. 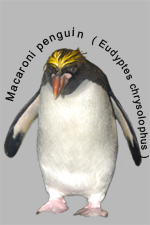 Macaroni and royal penguins are the largest of all crested penguins. They both have a golden (orange-yellow) crest, which starts in the middle of their head above their eyes. 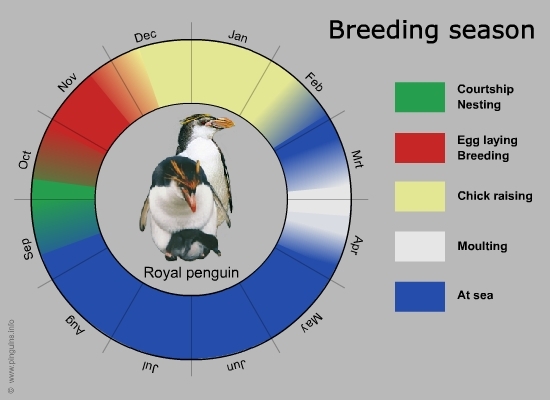 Royal penguins have a white throat, while macaronis have a black one. 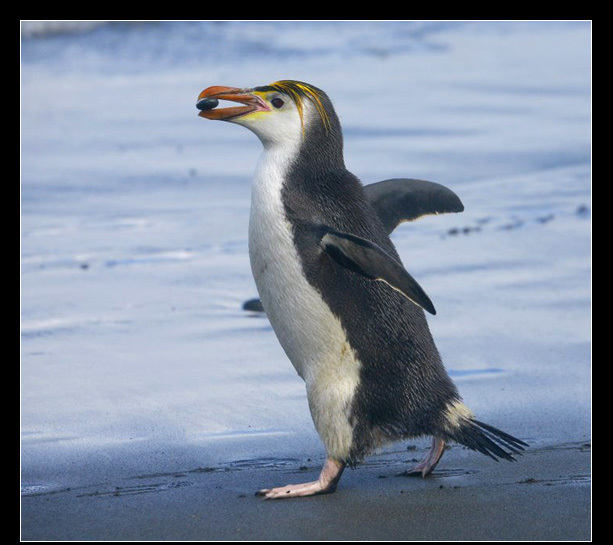 Macaroni penguins measure 60 till 65 cm tall. Females are a little bit smaller than males. Their weight varies during the year between 4,5 and 6,5 kg. 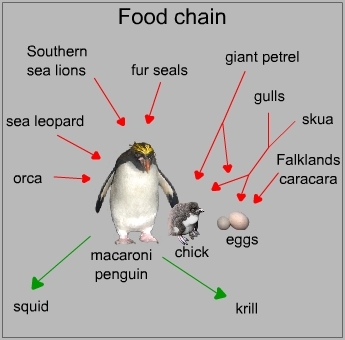 The macaroni penguin was first described by Brandt in 1837, who used the Latin name "Catarrhactes chrysolophus". 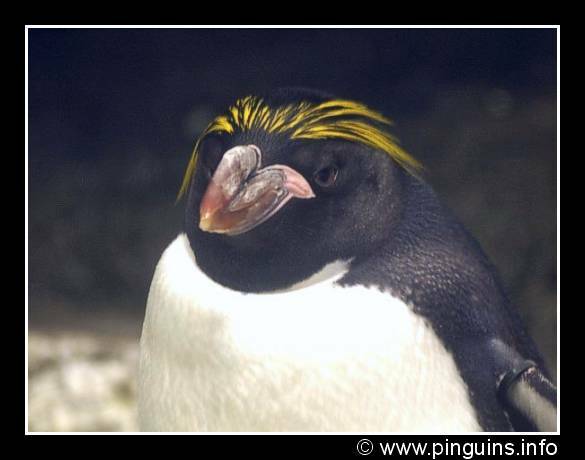 The name macaroni penguin derives from the Macaroni club, a group English men in the 18th century, who introduced the pasta macaroni in England and wore a yellow feather on their cap. 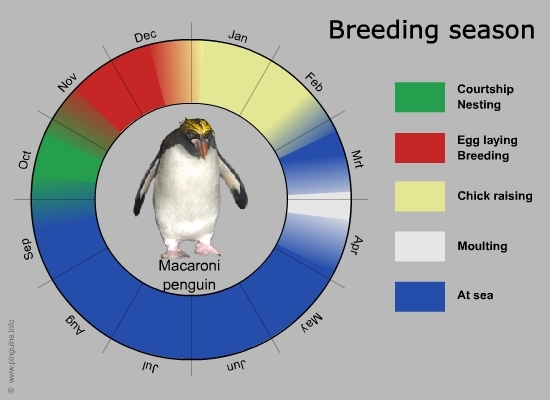 Macaroni penguins breed on the sub-Antarctic islands southern of America and Africa. Large colonies are found on South Georgia, Crozet Island, Kerguelen Island, Heard Island and McDonald Island. The total breeding population is estimated at 12 million pairs. 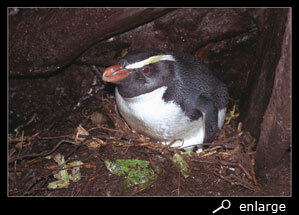 Macaroni penguins nest in simple holes, digged out in mud or soft ground between the rocks. At sea the pairs live separated, they are only together during the breeding season. 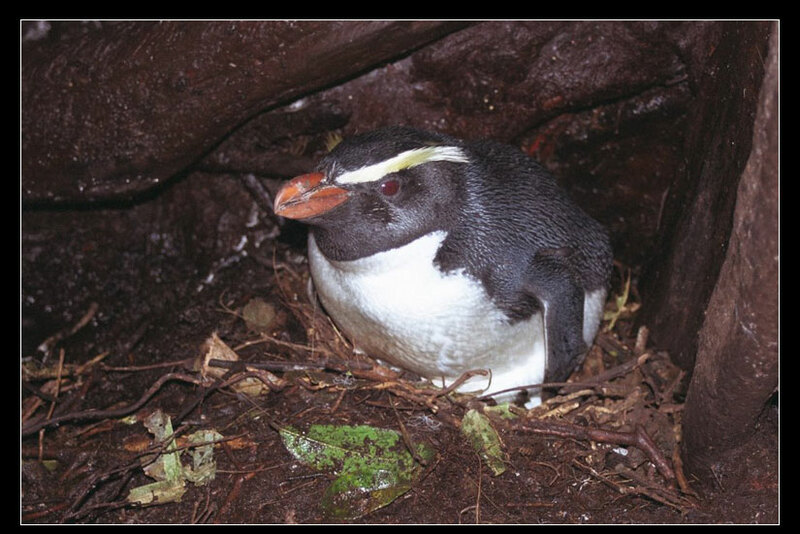 Depending on their nesting ground, the males return at the end of September (Kerguelen) or in October (Heard), search for a nest and collect twigs and material to strengthen it. While the nests lie close to each other (in reach of the neighbours) in large colonies, there is a lot of fighting and struggling going on. Some rookeries are shared with the smaller rockhoppers or, as on the South Shetland Islands, with chinstrap penguins. In November two eggs are laid, but only the second one will hatch. Incubation time lasts 33 till 37 days, and is shared by both parents in long, alternating shifts. The first 23 till 25 days after hatching, the male will guard the chick and the female will forage and feed the chick daily. Afterwards the chicks gather together in small crèches, will be fed every day or two, till they are ready to fledge after 60 till 70 days. On their turn they start breeding after around six years. The adults go 2 weeks to sea for foraging and then return for moulting. From end April till September the rookery is abandoned. They feed almost mainly on krill, with 5 % squid. 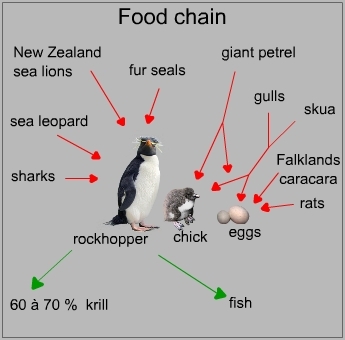 The ratio krill/fish/squid depends on the foraging site and season. During the breeding season they return daily, but otherwise they can stay away for days, foraging further away. The moderate diving depth is between 20 and 30 metre, but the record is 115 metre. Leopard seals lurk in the water, waiting for birds coming or going ashore. 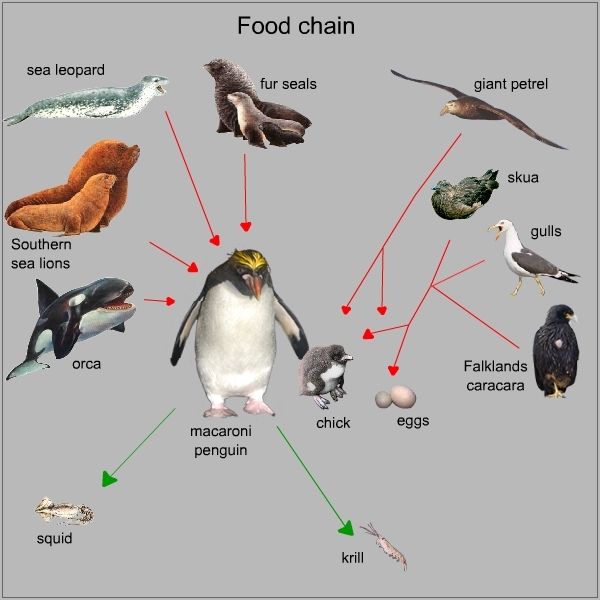 Fur seals and sea lions too chase for adult and juvenile macaroni penguins. Giant petrels catch unguarded chicks, and eggs are robbed by skua's and gulls. On the Falklands the caracara, a bird of prey, preferably eats eggs or little chicks. Royal penguins can only be confused with macaroni penguins. 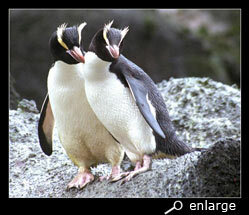 They are the 2 largest crested penguin species. They both have a golden (orange-yellow) crest, which starts in the middle of their head above their eyes. 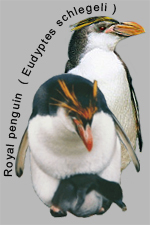 Royal penguins have a white throat and white cheeks, while the macaronis have a black one. 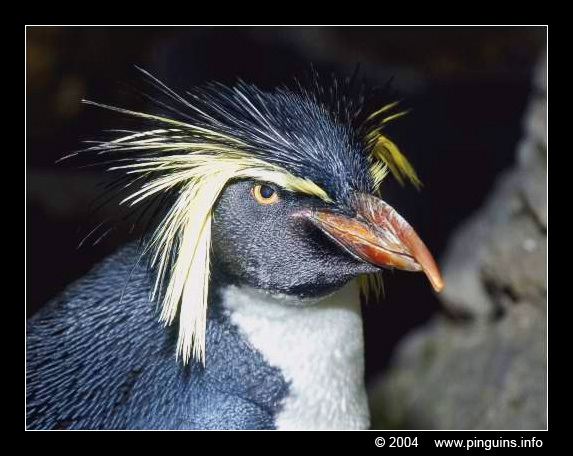 Some consider the royal as a subspecies of the macaroni penguin. 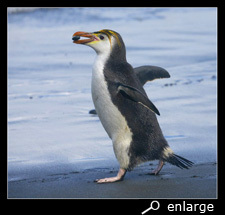 Royal penguin are about 60 cm tall. Their weight varies during the year from 5 till 7 kg. The females is a little bit smaller than the males. In 1876 the royal penguin was first described by Finsch. In Dutch sometimes called Macquarie penguin. Royal penguins only live on Macquarie Island and the small isles nearby. The total population is estimated at 850 thousand pairs. From May till September the colonies are abandoned. End September the males return, shortly afterwards followed by the females. Their nests are shallow excavations in the sand or between grass, with twigs and stones build up around it. The rookeries contain ten thousands of pairs at a large density. Usually two eggs are laid in October, but only the larger second one will hatch. And if the first egg (surprisingly) should hatch, the first chick will never survive, while the larger chick will be much stronger and oust the first smaller chick. Incubation lasts around 35 days, with both parents alternating in large "shifts" of about 12 days. The male guards the hatched chick during the first 10 till 20 days, while the female brings food. Afterwards the chicks will be left alone or in small crèches, being fed every 2 or 3 days, till they are old (65 days) enough to fledge in February. Afterwards the adult birds will go to sea to forage, returning end March-April for moulting. 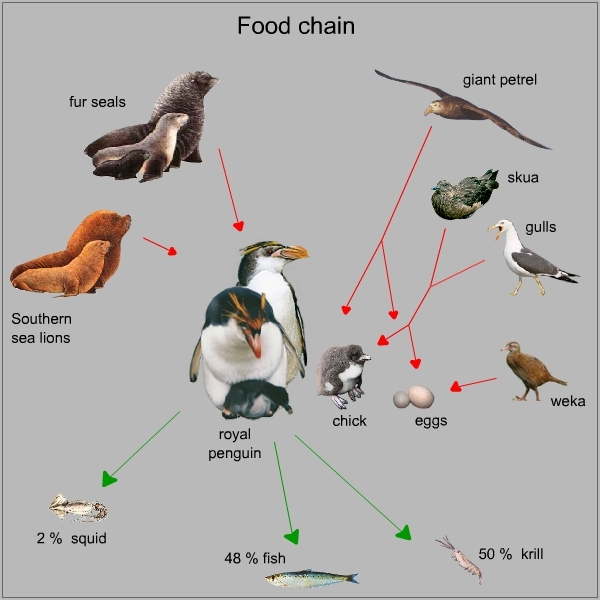 Their menu is not known yet, but they suppose royal penguins have a varied diet with about 50% krill, 48% fish and 2% squid. Royal penguins were slaughtered in large numbers in the 19th century for their oil, recovering very slowly of that massacre. As for all other species, adults suffer of sea lions and fur seals. Giant petrels catch careless chicks and steal abandoned eggs, and gulls like skua's will also rob eggs.